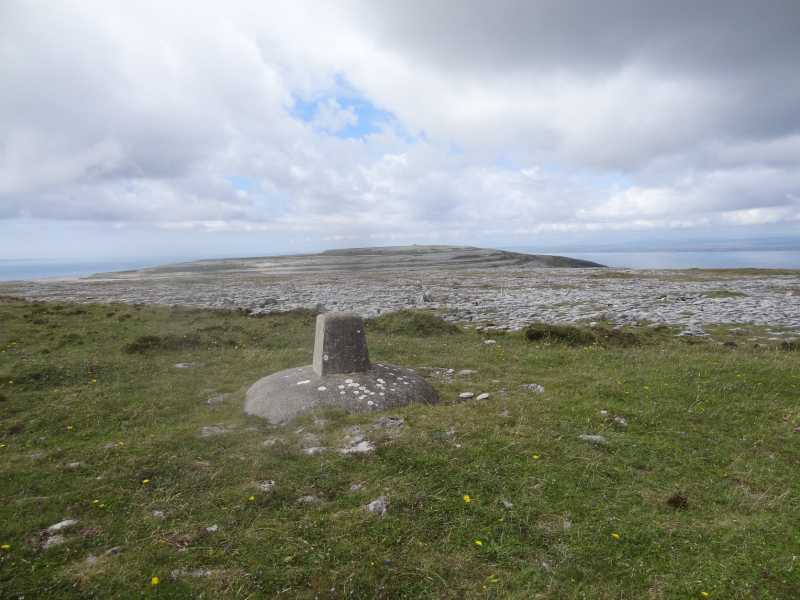 Gleninagh Mountain is the 1114th highest place in Ireland. 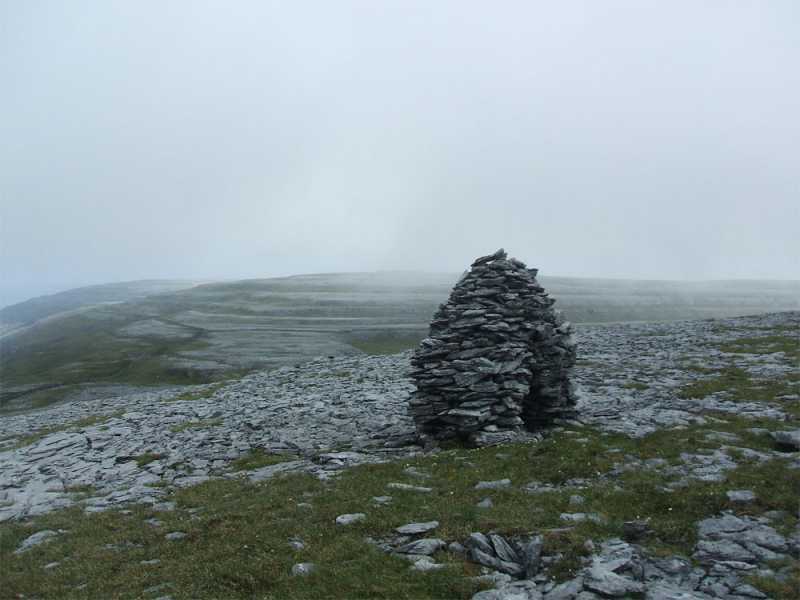 Gleninagh Mountain is the second most northerly summit in the West Clare area. 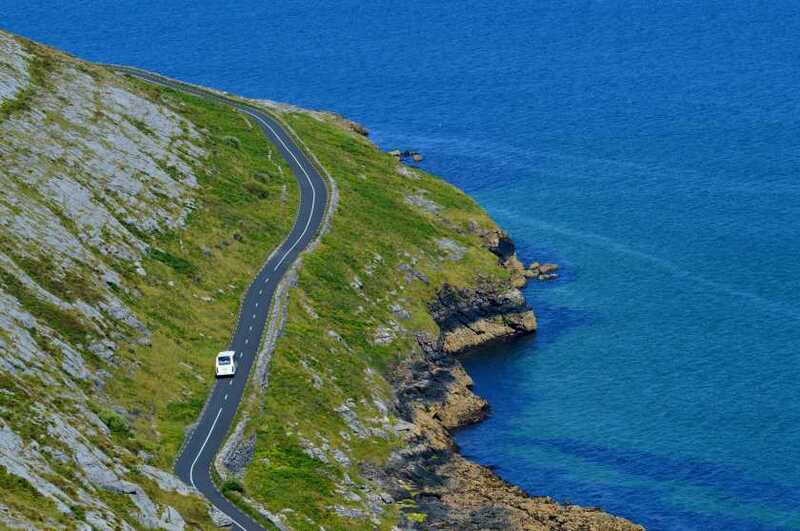 The Burren is a 300 sq km region of Co. Clare which is famous for its karst landscape. This manifests itself as magnificent endless exposed limestone plateaus, rocky hills and dramatic natural clean-cut steps and stairs and blocks of rock. Beneath lie breathtaking cave systems that are still being explored. While walking on the plateaus one encounters these ‘blocks’ of rock which are called ‘clints’. The cracks or fissures between them are called ‘grikes’. These require care as the rock of the ‘clints’ can be fractured and displace, and an unplanned step into a ‘grike’ could result in a leg or foot injury. With two hours available early one morning I completed a compact circuit of Gleninagh. I started to the south of Gleninagh at M 18995 07020 A. This is the start of a decent track that leads over the southern shoulder of Gleninagh. I followed the track uphill to the crest of where it crosses the long ridge of Gleninagh. I crossed the wall at M 18259 07104 B. 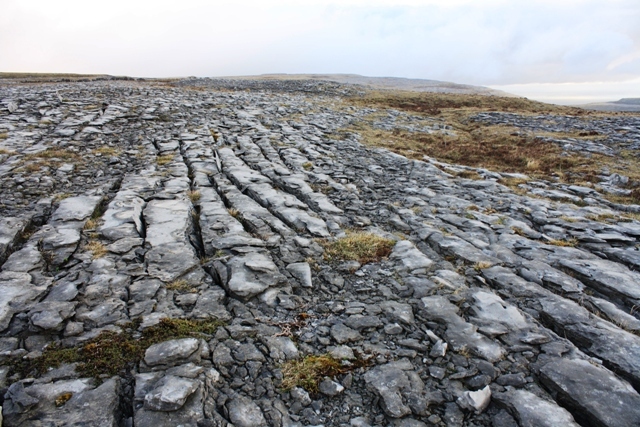 Then began a delightful 2km walk north across the best of the Burren karst landscape. This involved negotiating the endless clints and grikes of the exposed limestone. There are also lots of drystone walls to cross and peculiar flora abounds in the cracks and fissures all around. Overall it’s a lovely Burren experience. The approach ascent is very gradual. After 2km the summit mound of Gleninagh appears. It is disappointingly topped at by an ugly stumpy concrete trig pillar at M 17910 09508 C. (Yes this trig pillar is quite ugly as these things go). This is somewhat mitigated by the views which are very pleasant. It’s more likely you will be looking out rather than down at the trig pillar anyway. I continued down to the east where there was some steep ground, including limestone shelves, until I reached the col below at M 18659 09429 D. I followed a track from the col south all the way back to my car. This track completely disappears in places despite being marked on the map. I believe this is a reflection of the turlough lakes that appear and disappear seasonally in this region - the temporary lakes having wiped out evidence of the track in places. One example of the track disappearing is encountered at M18711 08933 E. Some very wet ground at times in otherwise dry underfoot conditions lend weight to this conclusion of turloughs being the cause of the intermittent track. The small track becomes tarred eventually as you begin to pass through a series of gates. However there are no houses (besides a half-built one) until you reach your car parked near a farmhouse at the starting point. 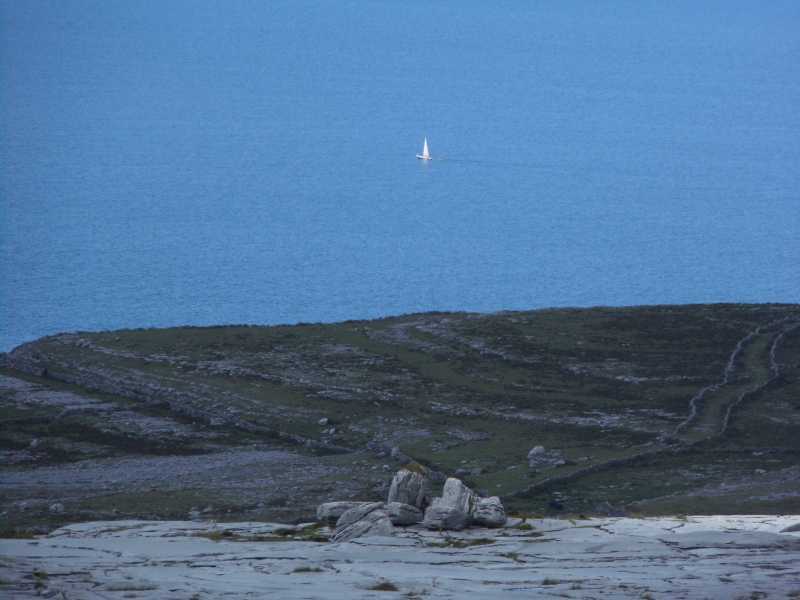 This is a delightful walk of about two hours that allows fine views north across Galway Bay to Connemara and the distant summits there as well as the surrounding features of this most curious karst landscape. Picture from hivisibility : Summit trig on Gleninagh looking to point 314. Picture: Summit trig on Gleninagh looking to point 314. Fanore to Ballyvaughan off road. Starting in Fanore at the start of the Blackhead trail at M14638 09273 F, this route follows an old cattle trail as far as Blackhead. Leave the trail at M15492 11648 G heading south east to the impressive Caherdoonish fort at M15796 11412 H. before leaving the trail to ascend Doughbraneen passing Caherdooneerish Stone Fort on the way. After taking in the fort, continue heading south east for about 1.5km to the cairn at spot height 314. The trig point on Gleninagh lies another kilometer south east from here.